On today’s podcast, we discuss Tracking and ROI from Online activity and how both form an integral measurement barometer of your local marketing strategy blueprint. 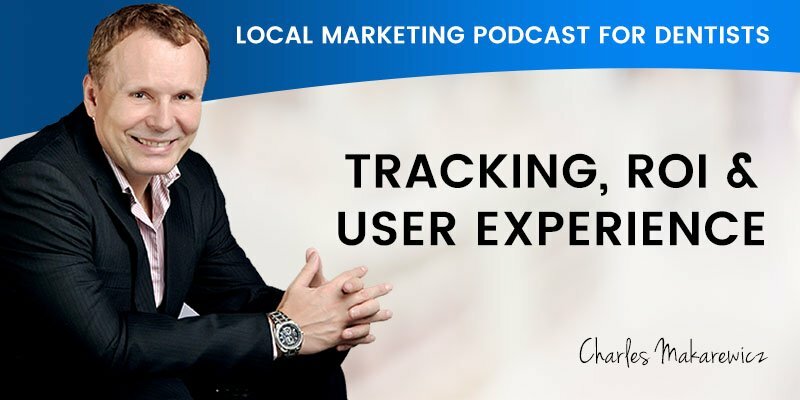 Scott: I’m Scott Edwards and today I have Charles with me to discuss tracking an ROI from online activity and how both form an integral measurement barometer of your local marketing strategy blueprint. Charles is the founder of Dental Marketing Expert, a company which specialized in local marketing for Australian dentists, and he’s responsible for many dental practices across Australia, dominating the local competition and attracting up to 15 new patients each and every week. Welcome to the show today, Charles. Scott: Charles, I know very well how passionate you are in your business about tracking your clients’ progress and results through every activity you implement for them. And I know you could talk for hours about this very subject. But let’s start with the internal tracking system within the dental practice. What’s your recommendations here? Charles: Well, definitely, we need to track your sources, so number one thing I recommend to do is to create a spreadsheet for all your incoming bookings. And you obviously will have the bookings from your existing patients, and you have the bookings for the new patients. So you need to divide that and then under the umbrella of new patients, you need to split that in offline and online. And how do you really track that is, your receptionist will probably need to ask the questions. At a certain level, the accuracy of that may not be 100%, but I’m sure you can get to the level where it’s accurate enough so that you can track your return on investment. The critical part here is that it’s done regularly, and ideally, it’s set up in shared documents. So in our agency, we use Google Spreadsheets, and that’s very easy to share. The tracking, ideally, is done daily. At the end of the day, you just need to enter the numbers. So if you have 10 bookings, you can say, 10 bookings. Five goes to our existing patients, and the other five goes in the online section. And then online if you’re doing some pay advertising, perhaps that might be displayed in Google Ads section. Ideally, you’re running pages and you might have a tracking number or other tracking for Google Ad Words. So perhaps if five of them is Google Ad Words and the rest of the online bookings most likely will be from a local marketing system you build. The receptionist also should ask the question, “Where did you first find about us?” And that is critical part of your system. Scott: Charles, moving on to the dental website, what are the critical components here that you recommend? So it’s a common … It’s a very important question to tackle, and so let’s get going. So number one is you can definitely track Google My Business. So obviously, you have a Google My Business and that’s linked to Google Analytics. And in the dashboard, you actually can track a lot of things. So you can track phone calls and you can track how many visitors went to your website, as well as you can track how many people asked for directions. So that’s a good data, so that’s something you should check monthly and evaluate it. And that’s how you track it, obviously. You have a Google My Business and you have the login handy. So you can login and look at the dashboard each month. And if you’re working with an agency, specializing in local marketing, you should request the data. And they need to format that nicely to you, because there’s some confusing data there as well. You might look at the number of searches, etc. You really just want to know how many bookings came from it and how many visitors to the website and how many people search for directions. So those three are the important things you should be asking for. Additionally, websites might have web forms, and we normally use them for our clients. Even if we have a booking portal installed, we still have a web forms, because not everybody wants to book an appointment with you. A lot of times the patient wants to ask you a question, and if you’re only offering a book directly online, you lose some of them, because they don’t want to book it yet. They just want to ask you a question. So you have to make sure you have a lot ways of contacting you. So number one will be, obviously, a very visible phone number. And number two is if you have a direct Book Now portal which is integrated with your practice booking system, you have that as a number two. And number three is you should have a web form booking. And that web form booking, you need to set up that way that has a thank you page, a dedicated page, which you can install conversion tracking and that simply is very easy to track. Additionally, Google Analytics should be installed on your website, and that is something you need to monitor. It’s got a lot of things; it’s quite complicated, but looking at visitors to your website, monthly visitors. And if you set up some conversion goals and if you’re running Google Ad Words, they should be already set up for you. So then you can track your conversion. And other things, well Webmaster Tools is great. Setting that up is important, because you can monitor a lot of things, what’s happening in your website and if you have any errors and things like that. That’s really important. It doesn’t really track as much for your return on investment, but it’s a sort of tracking device which should be installed and set up correctly for you. Additionally, Heat Map software will help you to look at your dental website performance, what patients are clicking on, what they’re not clicking on, and it will help you with optimization of your website. So again, with Heat Map tracking, it doesn’t exactly show you the return on investment, but it will help you to optimize your websites, to improve your conversion. Now, you also should have some re-marketing codes. So if you’re running Google Ad Words, you definitely should have a re-marketing code, so you can re-market to the existing website visitors. The same applies to Facebook. So from day one, you should basically install the Facebook pixel, so you can build a custom audience. And that need to be set up to maximum 180 days. That’s the maximum in Facebook, not the default 30 days. And then that’s all. You just can leave it. You don’t have to do anything with it, but you need to be installed from day one. Scott: And offline, what should the focus be on here, Charles? Charles: The number of offline campaigns will dictate how you need to setup your tracking here. So for example, if you have a local newspaper ad, you can set up a dedicated phone line for that, a tracking phone line. As well as you can set up a dedicated website page. So you could have your website/magazine-ad1/, Or you can have a completely separate website, like a landing page type, where you can take the details or you can have that integrated directly with your booking portal. And what else you could be doing? You could have radio ads, and the same, with radio ads you could have the dedicated mobile line and dedicated website URL, so you just buy the domain and your developer can setup a landing page for you. And additionally, you can do pamphlets and it’s exactly the same. It should be easy to track. It shouldn’t be just your website, because then you can’t track the return on investment. So every campaign should have your dedicated landing page and dedicated phone number for tracking your offline activity. So now, when it’s all set up and every single campaign, online and offline, has their own tracking phone number or tracking URL, it will really help you to know where your return on investment is working and where it’s not. So if you have 10,000 pamphlets distributed and you have a dedicated phone number, you can track it. If you have a dedicated website, you can track it. Having Google Analytics on it, you can track it. And obviously, if you have web forms on it, the same thing. You can have a thank you page and you can track that. Without this question being answered and recorded, you’re missing the major piece of the puzzle. The online tracking is great, but equally important, but it doesn’t allow you to identify the individual to the activity, asking the question does. Well, that wraps up today’s podcast, folks. 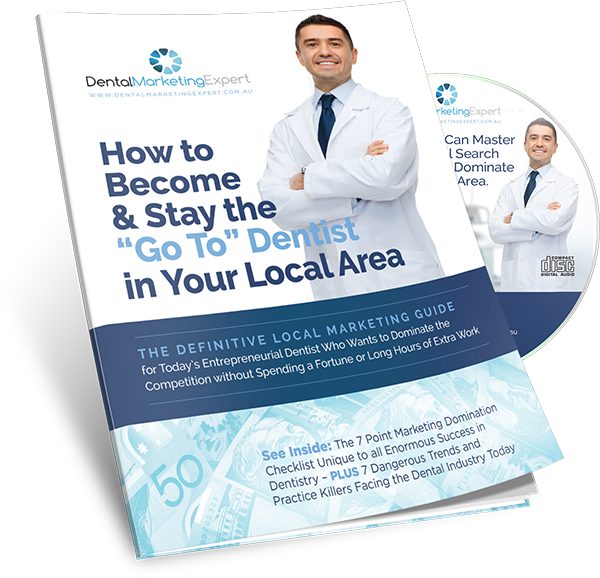 Stay tuned for our next episode, when we discuss social media and what does and doesn’t work for local dentists seeking a positive return on investment for your overall local marketing strategy.